octowards is an original word puzzle game. To play, drag letters to form words. You can drag a letter in any straight line (horizontally, vertically, or diagonally), as long as the straight line path is clear. The game won't allow you to make an invalid move, but it can't force you to play a valid move, so the onus is on you. As each newly formed word is recognized it disappears from the grid, and your score is incremented. each word you form is worth the length of the word multiplied by the length of the word minus one. 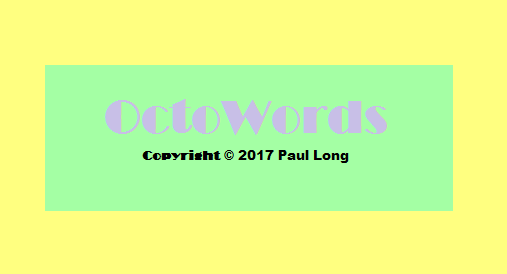 Words entirely contained in the green octagon are worth 3x as much as words partially or completely outside of the octagon. Most words recognized by the game are two, three, or four character words, but more skillful players can create longer words, and also creating situations where two or more words are formed by placing one character will earn you extra points. Theoretically, words that will be recognized range from two to twenty characters, but as you'll see it's difficult to build a long word without the smaller words contained within your longer word being recognized first, so there is a large amount of skill necessary to become a proficient player. 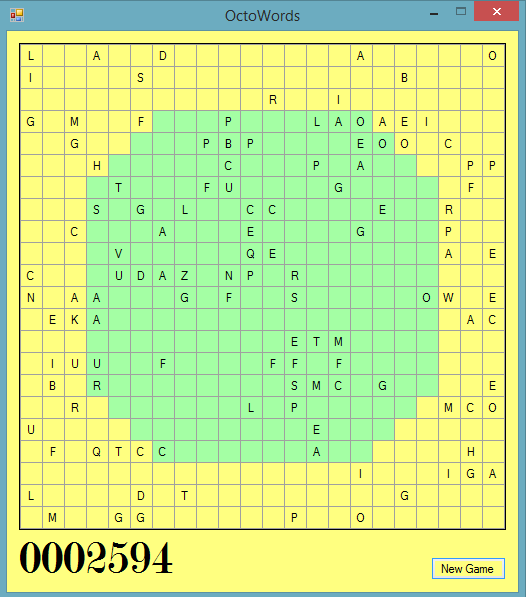 The Game class is used for creating each new game, and also for checking if there are any possible words left to find in the grid after each move at every stage of the game. frmHighScores displays the five highest scores, which are saved in a Settings Specialized.StringCollection. 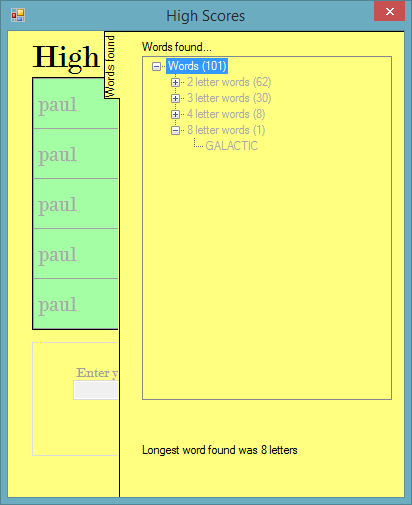 The Form shows at the end of each game, and also has a TreeView (in a slideOutPanel) that shows how many words of which length were found in that game. /// Necessary to handle user selections in the dgv. Nowadays more than ever, the average person can invent, create, and market their ideas through the use of the desktop computer. This game is a simple idea, and the code involved is easily written with a little experience. All of the controls used are standard VB controls, manipulated slightly to give the necessary functionality and overall appearance.